What the future holds for corporate IT organizations and the people who work within them is an unknown. But, in the words of the man dubbed "the founder of modern management" Peter Drucker: "The best way to predict the future is to create it." With the ambition to avoid the more usual ITSM survey questions such as the current and planned level of ITIL process adoption or the inclination for ITSM tool replacement. Greater detail on each of these can be found in the main body of this report. Details on the ITSM survey's promotion methods and respondents are included in the end notes. 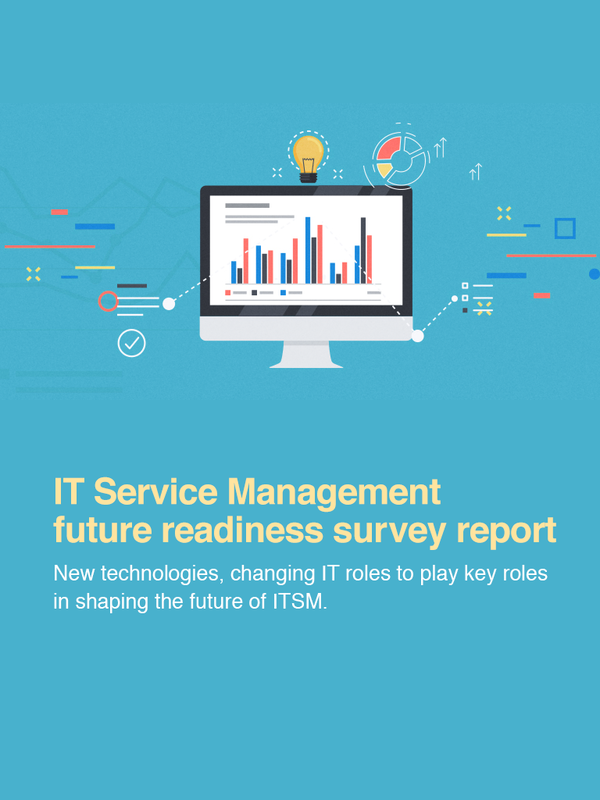 ITSM Future readiness survey 2017 : Are you ready for the future of ITSM? Working in IT can be a challenge no matter your role. The corporate mandate for IT departments to "do more with less" has been prevalent for at least a decade; with IT skills shortages, increasing technology and business complexity, security issues, and other things all adding to the challenge. So, is "IT life" getting harder? And how are the people working in IT recognized, and hopefully rewarded, for going the extra mile in their roles? Do you think working in corporate IT will get harder over the next three years?
" 82% of respondents believe that working in IT will get harder over the next three years, and only one in four respondents feel that their efforts and value are sufficiently recognized by management." With a total of 82% of respondents believing that working in IT will get harder over the next three years. Only 15% of survey respondents didn't think that their life would get harder. As to why there's a higher response for "Yes, for some IT roles" than "Yes, for all IT roles" - this might reflect that some IT roles are getting harder, or it might just be the very-human assumption that "the grass is always greener on the other side of the fence." With respondents thinking that they are in a particularly difficult role versus their peers. For instance, service desk agents are usually under far greater scrutiny (and pressure) in terms of performance metrics and targets than most other, if not all, IT roles. Whereas in some areas, such as the management of legacy IT systems, roles might be viewed as being under less pressure and less likely to change. Do you feel your personal efforts, and your value to the business, are sufficiently recognized by management? One quarter of respondents felt that their efforts and value are sufficiently recognized by management. Leaving two in four people thinking that they do get recognized but not enough, and one in four thinking that they don't get recognized for their work; giving a total of 75% respondents who feel undervalued. This compares unfavorably with a recent US survey that showed 47% of workers feel underappreciated. The Republican victory in the US. Hence, the survey posed two questions related to the potential effects that immigration barriers would have on IT recruitment. The questions were also posed in a manner such that the respondent could answer either on a personal level, as a job seeker, or alternatively as a recruiter of people. Do you think the current local, and global, political climate is adversely affecting IT recruitment?
" Nearly two-thirds of respondents think that the current local and global political climate is adversely affecting IT recruitment. " Nearly two-thirds of respondents thought that the current local and global political climate is adversely affecting IT recruitment - with some roles seen as more affected than others. The question was intended to understand the potential difficulties currently faced by people wanting to work in, or recruit from, other countries; but it's appreciated that it could also include responses related to the effect of government fiscal policies dampening economic growth and consequently the recruitment of new staff. Do you think the changing political climate will make the future recruitment of key IT staff difficult? The above breakdown shows that the future recruitment of IT staff is more likely to be limited to certain geographies than a globally-impacting issue. But with nearly two-thirds of respondents expecting current and future political decisions to adversely affect the recruitment of key IT staff in at least some geographies, it's definitely an area in which corporate IT organizations need to plan for a change to the status quo. There's no denying that corporate IT is undergoing what has to be the most consistently-turbulent period of technology change, coupled with changing business expectations of IT services, service delivery, and support. Cloud has played, and continues to play, a big part in that change - potentially making it easier for organizations to buy/create, manage, and change business applications as needed. The cloud technology is in some ways now taken for granted. Many of the early cloud issues - related to security and service availability - have now been replaced by those related to people, skills, and cloud management capabilities. And those who consume IT services aren't concerned about where their email is delivered from, their files are stored, or their music is streamed from. The cloud technology just works, and works well - that is until there's a high-profile cloud failure. To your knowledge, did the February 2017 AWS S3 failure negatively affect your company's position on cloud? The ITSM survey responses were affirmation that people strongly believe in the benefits of public cloud services despite any high-profile failures reported in the media - only 8% of respondents felt that the Amazon failure had adversely affected their company's position on cloud. And while 24% of respondents stated that it got them "thinking about risks," this is a positive thing, and a timely reminder of who is ultimately responsible for IT service availability in cloud service models - the customer. Do you believe the use of artificial intelligence will reduce IT staff numbers between now and 2020?
" Just 16% of respondents view the adoption of artificial intelligence (AI) capabilities as a serious job killer in IT. " So, in the main, the survey respondents don't see AI as a major threat to IT jobs - with only 15% of respondents viewing the adoption of the new capabilities as a serious job killer. In many ways, AI can be seen as the next evolution of automation, following data center automation, ITSM-process workflow automation, and orchestration. Adding "heavy thinking," especially through machine learning, to the existing "heavy lifting" benefits of more traditional automation. The evolution of ITSM best practice is an interesting area to investigate, with it subject to the pressures of both the changing IT and business landscapes plus the introduction of new, or increasingly popular, approaches to IT management and service delivery that include DevOps (including Lean and Agile), service integration and management (SIAM), business relationship management (BRM), enterprise service management, and IT4IT among others. One could also argue that the impact of the growing adoption of cloud services on ITSM has been seen through two different, and opposed, lenses - with one school of thought being that ITSM is less relevant with cloud, and the other being that service management capabilities are now even more important. After all, cloud offers services that need to be managed. In your opinion, do you believe ITIL, and other ITSM best practice, have kept up with the changing business and technology landscapes?
" Only 24% of respondents think that existing ITSM best practice has kept up with the changing IT and business landscapes. " Only 5% of respondents aren't bothered if ITSM best practice has become outdated. It's testament to the industry's ongoing interest and reliance on the sharing of things that will help to improve operational performance and IT service delivery. 14% of respondents believe that a complete refresh is needed. This could, of course, mean multiple things. For instance, that not enough has changed to warrant a complete refresh. Or, alternatively, that a single body of ITSM best practice knowledge is going to be too difficult to deliver and maintain; and perhaps, because of the increasing rate of change, that a complete refresh could already be out of date by the time it's published. There's a need to do something though, as only 24% of respondents think that existing ITSM best practice has kept up with the changes happening around it. If you still think that this is high, then please remember that different people, in different organizations, have different needs. For example, if an organization only needs to use ITSM best practice related to the IT service desk - incident management and service request fulfilment, say - then they're more likely to think that the currently-available best practice is sufficient than a different organization that is looking to understand how best to meet capacity management needs in a hybrid cloud environment, say. How involved have ITSM personnel been in your company's DevOps activities and ambitions?
" 70% of respondents think that there has been insufficient involvement of ITSM personnel in their company's DevOps activities and ambitions. " "High performers have: 46 times more frequent code deployments; 440 times faster lead time from commit to deploy; 96 times faster mean time to recover from downtime; and 5 times lower change failure rate (changes are 1/5 as likely to fail)." "High-performing organizations spend 21 percent less time on unplanned work and rework, and 44 percent more time on new work." But as DevOps is about Development and IT Operations, and ITSM is part of the latter, it's disappointing - although not unexpected - to see that only 13% of respondents feel that ITSM personnel have been fully involved in their company's DevOps activities and ambitions. With 70% of respondents stating that there has been insufficient or no involvement. While the thing that the IT industry called the "consumerization of IT" shook up many, if not all, corporate IT organizations in terms of what corporate IT devices, apps, and cloud services should be like. The industry overlooked that consumerization is about so much more than just the IT. That, instead, consumerization is a far-wider-reaching phenomenon through which employee expectations of corporate services, service delivery, customer support, and customer experience are being influenced by their consumer-world experiences. The bottom line is that, as employees receive better services and support in their personal lives, they expect also more from corporate service providers such as IT, human resources (HR), and facilities. How do you think your IT department is meeting employee expectations - across services, support, and customer service - versus consumer-world companies? Interestingly, and surprisingly, 29% of respondents think that their IT department delivers better services, support, and customer service to employees than could be expected from consumer-world companies. This could, of course, be the case - that the companies the respondents work for deliver exemplar IT services and support. However, it could also be an indication of the continued disconnect between IT-employee perceptions of the services they provide and the growing expectations of employees - "the expectations gap." Perhaps more expected is that 28% of respondents think that their companies offer a similar level of services, support, and customer service to consumer-world companies, with the highest score (40%) attributed to IT departments being behind the consumer-world. Is your IT department ready to meet the expectations of the growing number of Millennial employees?
" 70% of respondents think that there is still more to be done to meet the expectations of Millennial employees. " In many ways, this is also an indication of IT department readiness for consumerization, as the enhanced needs of Millennials have been built on their consumer-world experiences of technology and their access to information and services. Underestimate the impact that consumerization is having, and will continue to have, on employee expectations of corporate IT - as a massive 57% of respondents think that their IT department currently matches or exceeds the efforts and capabilities of consumer-world companies. Rate the wants and needs of Millennials higher than the needs of older employees who have also had their expectations raised significantly by their personal-life experiences of services, customer service, and support. Either way, it requires IT departments to better understand the needs of all end users and how well existing capabilities are meeting those needs. Hopefully this paper, and the survey it's built on, has you thinking about many of the key challenges, plus of course the opportunities, that ITSM professionals are currently facing and will continue to face over the next three years. Whether these challenges relate to the difficulties of working in IT, recruitment, the impact of new technologies, using best practices to better meet growing service expectations, or something else - we achieve more as an "ITSM community" when our concerns, issues, and solutions are shared. So, use the information provided by ITSM and IT support membership organizations, ITSM services and tool providers, or ITSM content distributers to not only stay informed, but to also receive advice on how best to be ready for the future needs of IT service management (ITSM). Change is hard but don't make it even harder by failing to tap into publicly available help and advice. ManageEngine's flagship product, ServiceDesk Plus, is ITIL-ready help desk software used by ITSM professionals worldwide. With industry certified best practice ITSM functionality, easy-to-use capability and native mobile apps, ServiceDesk Plus helps IT support teams deliver world-class service to end users on the go with reduced costs and complexity. Leveraging the latest technology and available in both cloud and on-premises versions, it comes in three editions and is available in 29 different languages. Over 100,000 organizations across 185 countries trust ServiceDesk Plus to optimize IT service desk performance and be future ready with their IT service management operations. For more information about ServiceDesk Plus, please visit manageengine.com/service-desk.